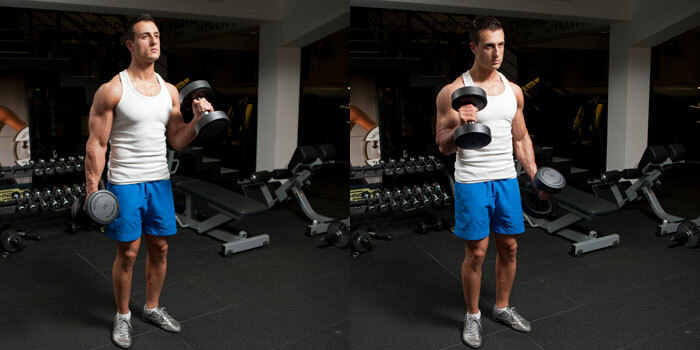 Grasp set of dumbbells and stand upright with your hand to sides and palms facing in. Position your feet about 15-20cm. apart and keep your knees slightly flexed for a better stability during the movement. This will be your starting position. As you keep your upper arm stationary and your palm facing in inhale and start to curl the dumbbell of the right arm until you reach a fully contracted position. Hold for a second, squeeze your biceps and lower the weight in controlled motion back to the starting position as you exhale and then repeat the movement with your left arm. Continue alternating in this fashion until you perform the desired amount of repetitions for both arms. Do not swing the body back as you curl the weight, the body should stay stationary throughout the movement. Perform the negative phase of the movement for twice longer time than the positive to achieve maximum muscle activity and better development.